When Bill Robertie won the world championship in Monte Carlo this summer, few people in the backgammon world were surprised. Since his first major tournament victory in 1979 (the B.S.O. ), Robertie, a 37-year-old computer programmer from Boston, has come to be regarded as one of the top backgammon players and authors in America. He was the backgammon columnist for The Boston Globe from 1978 to 1981, the author of one of the finest annotated matches ever publishedan earlier Monte Carlo championship between Lee Genud and Joe Dwekand a regular contributor to Backgammon Times. Like many backgammon superstarsPaul Magriel and Kent Goulding, to name twoRobertie began as a chess player, achieved the rank of national master and at 24 became the U.S. Speed Champion. 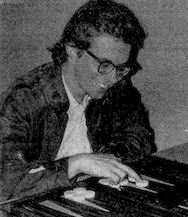 But in 1976, during the height of backgammon's popularity, Robertie caught the feverand stopped playing chess altogether. "It happened after I saw the kind of money tournament backgammon players were making," he explains today. "I figured I could do the same." He started by reading the books of Jacoby and Crawford, Holland, Cooke, and Dwek. Magriel's book, which appeared at the end of 1976, was the most influential. "Magriel forced me to rethink my checker moves," he recalls. Also at the time, Boston chess players like Norm Weinstein and Dan Harrington turned to backgammon and they would play for nominal stakesten to twenty-five cents a pointat the Boston and Boylston Chess Clubs. When Robertie got good he played at the Cavendish, Boston's premier backgammon club, against verterans like Mel Drapkin and Sam Hanna. Robertie's first recognition outside of Boston came in 1978. As a virtual unknown with little tournament experience, he upset Paul Magriel in the Super Sixteen Tourney in Las Vegas. Two years later he captured the prestige Championship title at the Las Vegas Holiday Tournament, defeating among others star player Mike Senkiewicz. Today, Robertie is on the cutting edge of backgammon theory, and along with a handful of authors and players he is breaking new ground in game strategy. "I find there are problems with the backgammon books from the past," Robertie explains. "For instance, if you follow Barclay Cooke's advice on tournament playthat is, you play differently depending on whether you're up against a weaker or stronger opponent, or if you're ahead or behind in a matchyou are making a serious mistake." Robertie has discussed his theories of play in his book and in various articles, but writing books, he tells us, usually proves helpful to him since he often plays out positions hundreds of times before writing up his analysis. Two major works are forth coming: a collection of two-hundred cube and checker problems and an annotated version of his own Championship match in Monte Carlo. Incidentally, Robertie's performance in Monte Carlo was spectacularbetween the Warm-Up event and the Championship he won sixteen straight matches. How did he do it? He admits, "I was obviously lucky, and I played the best I have ever played."